Abutilon indicum is a type of weed commonly called as Indian Mallow. It is mostly found in tropical region. In south India it is commonly seen in bushes. This plant can reach upto 1 to 2m with leaves arranged alternately. Flowers looks yellowish with 5 to 7 cm long stalks. Fruits are green in colour and brown when it dried, it looks like cylindrical shape. We'll get some itching feeling when our body get contact with the plant. 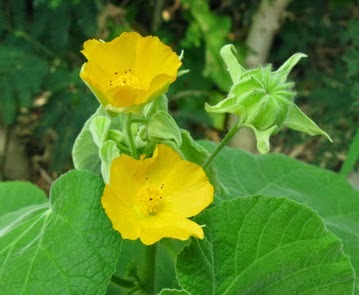 Various parts of Abutilon indicum are used in traditional medicine. Parts are uses as a sedative, laxative, diuretic, anti-inflammatory and astringent. Also it is used for treat leprosy, ulcers, headaches, gonorrhea, and bladder infection. It is used in relieve symptoms of diarrhea and get rid of thread worms in our body. Roots, leaves, flowers, seeds and stem are used in traditional tamil medicine. All parts are dried and consumed daily to relieve symptoms of cold and fever. Leaves are used as tonic. Dried seeds are used as purgative. Decoction made from the leaves is useful for cure tuberculosis, ulcer and bleeding disorders. Whole plant with root is dried and made as powder and taken daily for 6 months by ladies till marriage and said to be help for safe pregnancy.